Hoe hoe grow: Erysi - mums the word! Congratulations on joining the club, I am semi retiring from November. 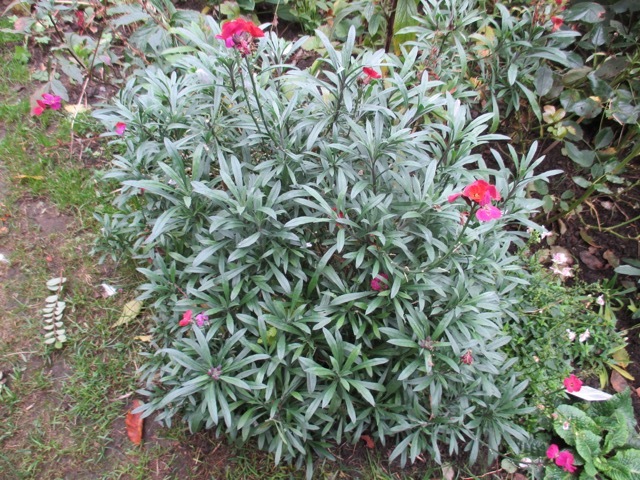 Winter Rouge is tempting me to try again with perennial wallflowers. Our garden tends to be a little shady when next doors trees leaf up. I have been waiting to join this elite club Brian ! "Semi' sounds just right at the moment! Enjoy! Although most websites I consulted said 'full sun' several said that they would do fine in partial shade. Worth trying anyway! I have been stunned by the flower power of these plnts. I hope you're feeling better now, Jane, and that celebrations can continue - congratulations :) Erysimums are offered here - I think as winter annuals - so now you've given me good reason to pay more attention to them! I wonder whether I could carry cuttings through the summer...! Hi Amy, much better thanks - fizz has been drunk! 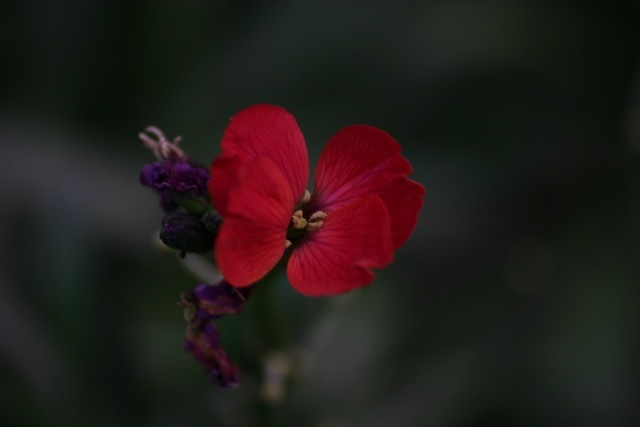 Erysimums are confusing as there are short lived, shrubby perennials, which I am writing about in this post, and also ones which are usually considered as annuals . 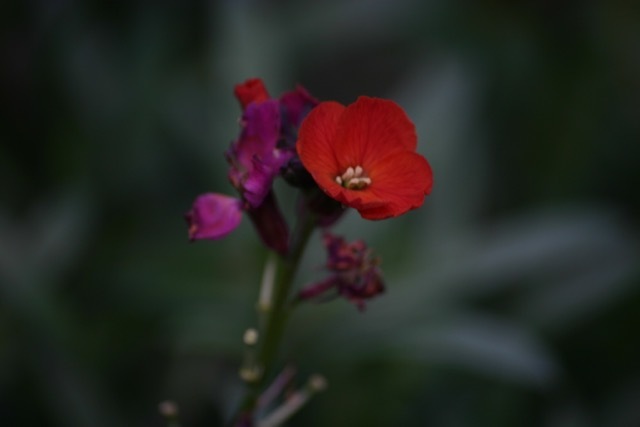 Both are wallflowers, but here in the uk it is the winter annuals which are sold as 'wallflowers' whilst the perennial shrubby ones are sold as Erysimums. Clear as mud eh?!! How long do your cuttings take to root? I tried some this year and so far zilch. They're in a pukka cuttings propagator too. Enjoy your 'retirement'.You'll probably be busier now than you ever were before.. I took some a few weeks ago and they have visible roots now. Late summer is the recommended time. I wonder why yours are so tardy, Jessica, as they are in a 5* suite!! Thanks, I intend to enjoy every second of retirement, and spend even more time with my wellies on! 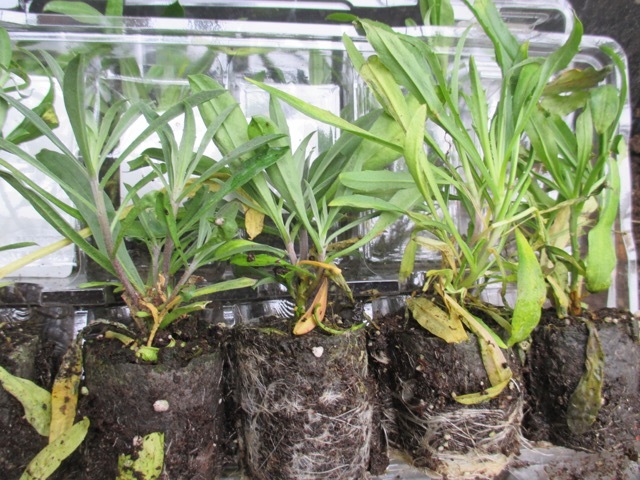 I tried some Erysimum cuttings this year (E. Fragrant Star) and I had 100% success rate in such a short time too. They used to be a plant I was never very fond of but I think that was because most of the ones I came across were leggy and past their best. I do agree that the winter wet is possibly more of an issue than the cold though. My E. Fragrant Star also copes well in an extremely windy spot too. Thank you Angie, I will not waste one second of my retirement ! Every one is precious! I was never very impressed by them either, I suppose because the flowers are small and, as you say, many get past their use - by date and become leggy. I will check out 'Fragrant Star' - does it do what is says on the tin ? 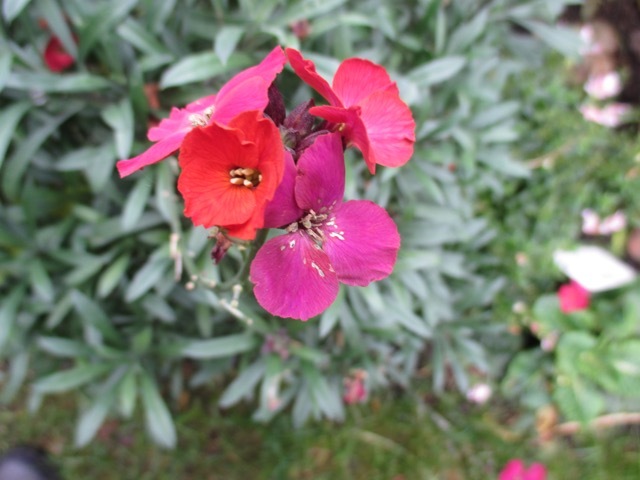 Fragrance and flower size are the main differences between the shrubby and 'annual' Erysimums. I have read how many love this plant. I was not successful growing them from seed, but I intend to still try. Hi Donna, I was not aware that it was possible to grow the shrubby Erysimums from seed, only from cuttings. Is it the 'annual' you have tried to grow from seed ? I do grow those from seed, and have found them easy to germinate and grow on, so I wonder why yours failed. Definitely worth trying again !! I bought a similar collection of erysimums last year. Our purple variety is still flowering to it seems to have flowered forever. Congratulations on the retirement. Martyn and I both retired early on the same day a few years go on now and have never looked back. I could hardly believe the length of the flowering period of the Erysimums in my garden. They never seem to stop. Why didn't I discover them years ago. I am not familiar with this plant. It looks great. Hi Lisa, neither was I until fairly recently! Well worth getting your hands on one if you can. I share your admiration and have always wondered why their common name was coopted to describe the shy and unappreciated girl who sat out every dance. Funnily enough I was musing about the origins of the name too. Shy and retiring is the LAST thing they are, so I am bemused by the connection ! Happy retirement! 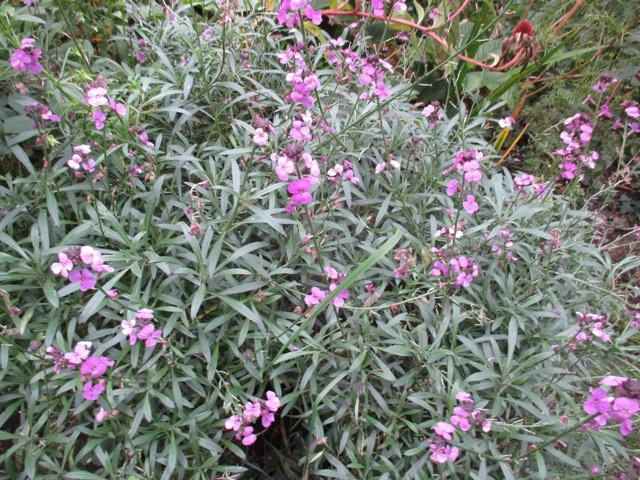 I've never grown Wallflowers, but they are beautiful--especially en masse as you show them. Enjoy your extra gardening time! Thank you ! I will enjoy the luxury of extra time gardening! Erysimums certainly earn their space in the garden, they just don't want to stop flowering. Every few years I take cuttings to keep them going and they seem to root very easily. Enjoy your retirement, you are going to be so busy! They certainly do earn their place in the garden, Pauline. How many years do yours seem to last, on average, before you replace them ? Some things I have read suggest they only really last a couple of years, whilst others say around 5. Do you find that the cuttings root easily, as Rusty Duck is struggling with hers, even though they are being well taken care of!! I would say about 5 years, then they need replacing with cuttings, which I find root easily for me. Thanks for that Pauline, most useful! Interesting that opinion seems to be divided between those who find cuttings root easily, and this who struggle to get them going. I love them too Jane and you have made me realise I probably don' t have enough. I have Bowles Mauve, Warburton Sunshine and Ruston Royal but those red and rusty shades are lovely. Fortunately they are so easy. Enjoy your semi retirement, more time in the garden- wonderful! Take care, the virus that I have had seems to last for ages, it really drags you down. Thank you for your kind comments, Chloris, I will enjoy every minute of that extra time in the garden! Hope you are better now after your virus ? I still have little energy but other than that am nearly back to normal. Thank you for posting this - i've been wondering about adding these to my garden for ages, and you've made up my mind. I love, love, love Spice Island. Stunning! Do it, Beangenie, you will not regret it !! 'Spice Island' has such lovely rich, warm tones. Lovely collection of cultivars of the Erysimums, I have to find out if they sell them here too, I did not see them before, except the 'Bowles Mauve'. Almost 25 years ago I bought a packet of seed of the Erysimum cheiri and all the wallflowers I now have are still descendants of the first ones. They are called wallflowers because they grow best against a wall protected from cold I think. I have them all the time against the front wall of our house in the gravel facing to the north. They are selfseeding there and when the old plants are leggy, I pull them out and put the selfsown young plants against the wall. The smell of the flowers in late spring is heavenly. Now I'm going to look for the wonderful 'Spice Island'. I am interested to know that your wallflowers self seed so well. 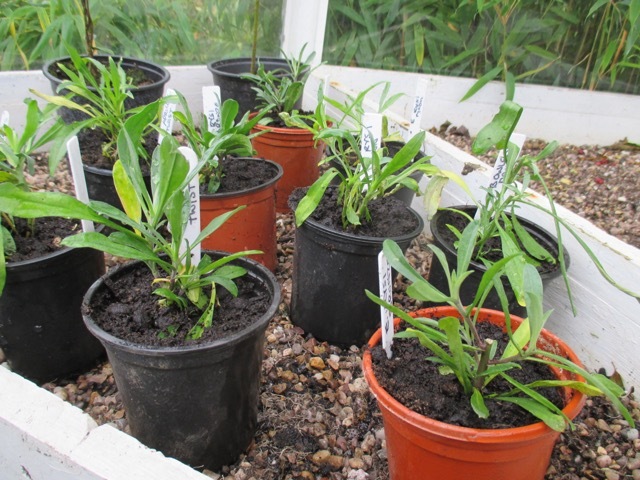 I have just planted out about 100 dwarf scarlet wallflowers and would love to think that they might do the same over the coming years. 'Winter Orchid' is lovely Janet, but the feeling was clearly not mutual with my plant, as it took an instant dislike to me and died!! I wonder if the key to successful cuttings is bottom heat (no sniggering please!). Some comments suggest they are easy as cuttings, whilst others struggle. Anna, I am so excited about the extra time. What better gift is there in this world? Go for it with 'Spice Island', it really is special! I totally agree Sue, I wish I had realised all this YEARS ago! I am such a recent convert! 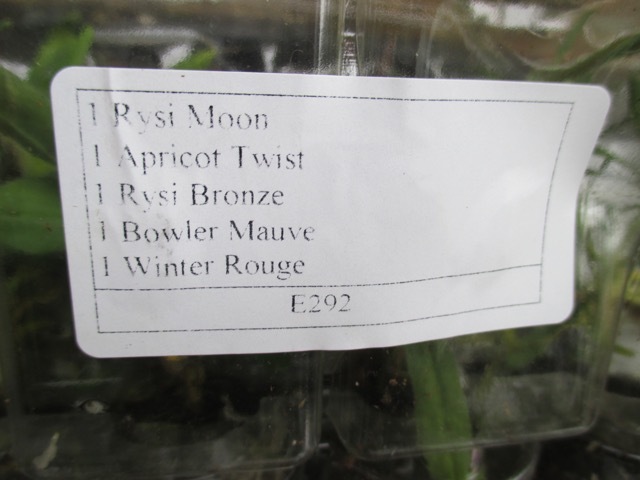 I have always had a few Erysimums Jane, usually 'Bowles Mauve', and as you say they are easy to propagate. 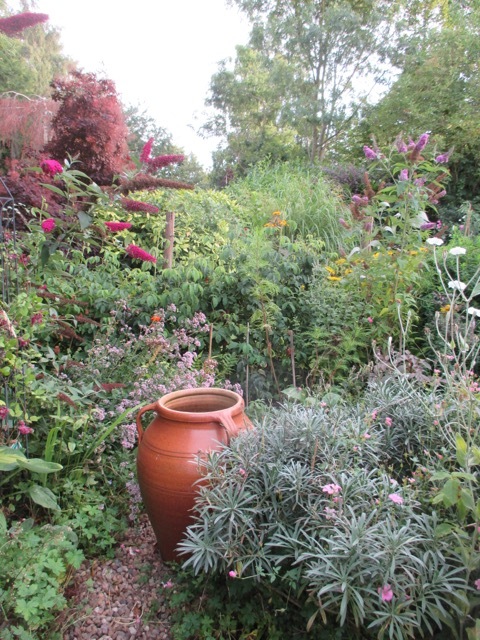 This year I have started converting my containers from bedding to perennials and as a consequence have bought in some cheap plants, including 'Spice Island', for this purpose so I am looking forward to developments. Hi Rick, we have been trying to do the same thing and save time and effort by converting from annuals to perennials for pots and tubs. 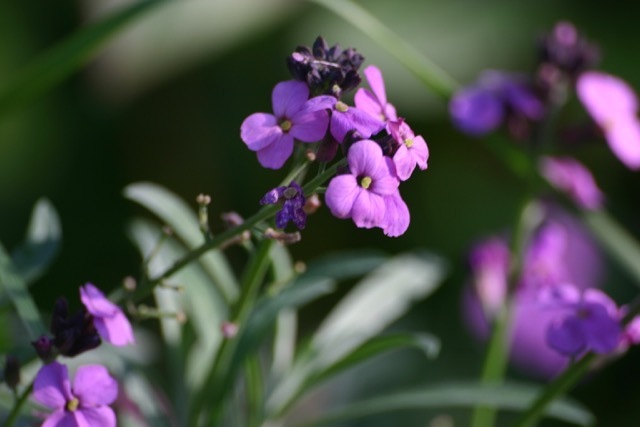 I hadn't thought of using Erysimum, so will be very interested to see how they perform for you. This is a new plant for me too, and I agree – the Internet is a wonderful place for plant hungry gardeners. Can be a quite expensive place too as the vast amount of plants available is mind boggling for a humble plantaholic, I just want one of each of everything! I too aim for one of everything! Pah to this planting in threes and fives ! What a waste of plant space! Congratulations and I hope you are feeling better. I am about to semi-retire as well and move across the country! It is a very strange feeling. I hope to have more time to garden in a fantastic climate and create a new garden.